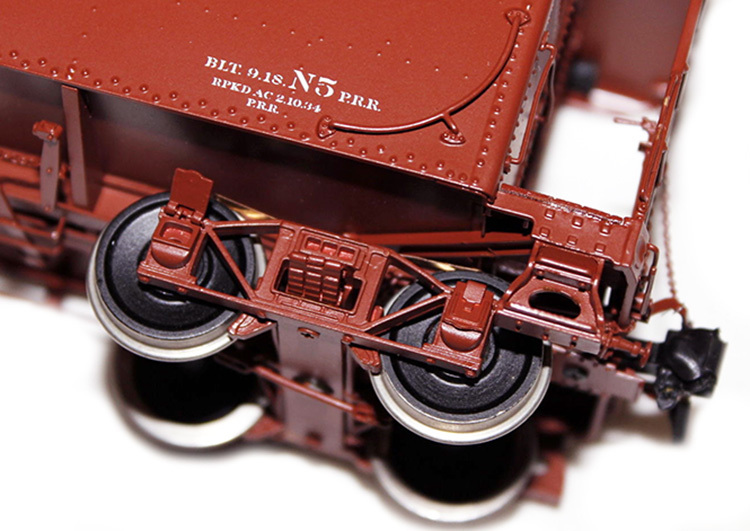 Availability: If you have an interest in purchasing an N5/N5b model they are now available. You can check the initial availability by viewing the updated online order form, but please contact us directly before ordering to confirm specific version availability. We will be happy to forward a package of literature upon your request and the project literature is also available for download on our Project Download page. 3/30/17 - The newly updated order form available for DOWNLOAD provides information about the currently available versions of this project. Be sure to check availability with us directly before ordering since some of the versions shown have only one or two models available. 11/08/16 - A new Project Information Brochure has been added to the download page. This new brochure is an update of the original offering brochure, including images of all the version produced. Enjoy! 10/12/16 - A new downloadable version of the Reject Model Information page has been added to the site to provide handy reference. You can access the link at the bottom of the Reject Model Information page. 8/15/16 - Apologies to customers still waiting on the delivery of your cabin cars, all distractions are being put aside at this point to make a final push on delivering the remaining models to everyone waiting! The process has been slow, but care has been taken to finish the final details requiring attention prior to shipping to avoid any disappointment when the new model is delivered to it's new owner. I can claim success in that regard, just wish the process was faster!! Again, many thanks to all for the great patience. 5/27/16 - The shipping of orders continues, unfortunately not as fast as I would like due to numerous interruptions and having to keep new project development proceeding on a timely basis. I hope to make great progress over the holiday weekend when 'things' should be a bit quieter. I am working to get this process wrapped up as quickly as possible. 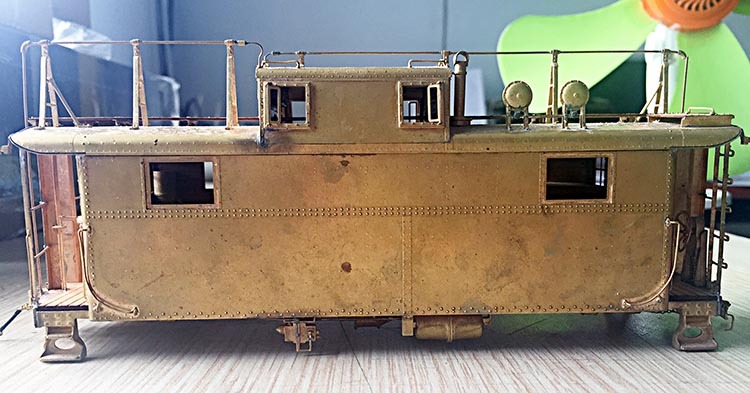 I have posted a new Instruction Sheet on the project website, it provides information for removing the cabin car roof, operating the interior and exterior marker lights and making the proper connection of the marker light leads to the carbody. This was a sheet that was not included in the model shipments up to this point. 4/25/16 - Please see the General News Update for today regarding the latest development with individuals lying to their buyers and selling junk models. 4/20/16 - Just a brief comment in response to several inquiries/requests; I do plan to post photos of all twenty-four versions of the N5/N5b project. Due to the time involved it will happen as time allows since the focus is on getting the models shipped to reservation holders and new orders. 4/18/16 - Reservation holders are certainly anxious to receive their models after such a long wait and I want to assure them that the shipping is progressing as rapidly as possible. The models are being shipped via UPS, so if I have an E-mail address on file, intended recipients will receive the UPS tracking information once the order ships. I can tell you that the response from those that have seen the models has been extremely positive, with most expressing that the wait was well worth it! I'm not sure that I would present that as my personal narrative on the subject, but it is gratifying that after all of the problems the models are being so well received. I remind owners as well as individuals seeking to purchase models in the secondary market that they should be mindful of the serial number plates and certificates that are part of the 'real' Kohs models. 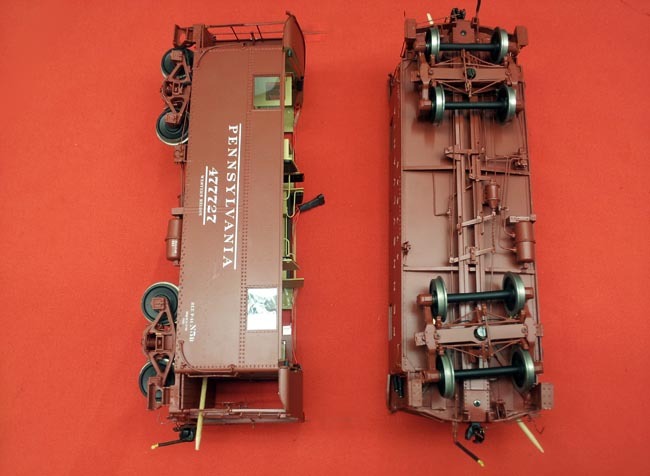 The likes of Jim Williams (Whitehall Hobbies), Bill Davis (American Scale Models) and Kent Loudon (ebay screen name OLDGUYFROMNJ) to name three, have taken advantage of modelers delivering them substantially inferior models and those will be resold over and over again by anyone looking to get rid of the junk models, so buyers beware! The online order form has been updated to indicate which model versions are available for purchase for anyone interested in acquiring a model or two or three. Please make a direct inquiry before ordering as many of the remaining versions indicated as available are only single models. 3/20/16 - Just a brief update to advise that final notices have been sent out to all reservation holders that have a remaining balance on their cabin car order. If you know you have a balance and you do not receive the notice, please let me know and I will resend it by E-mail if possible, otherwise by postal mail. 3/13/16 - The models are now in-house and the re-inspection is already underway. The models look even better to me than when I inspected them and I feel certain that the new owners will be just as pleased. As the final in-house inspection is completed, the final individual detailing is also taking place. 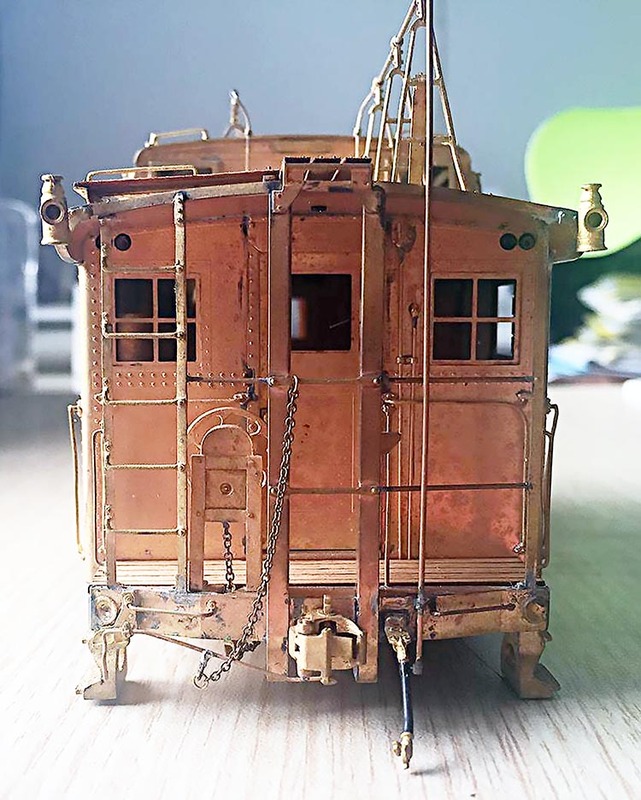 The project was so complicated due to all the versions that were produced, there were some small detail items I hesitated to request my builder to handle and I always prefer to make my 'mark' on each model before it is shipped. Despite the horrendously long delay, I can take great pride in the final results and the fact that I chose not to slight my clients with inferior models. Many lessons were learned both on the business side and the model making side of this endeavor and that will contribute to even better models in the future! I have to sincerely thank my new builder for his courage in accepting this project even after all the facts were considered, it is a testament to his business and the capabilities of his staff. I will be highlighting Mr. Lo and Primote in an upcoming writing on this sight, it will go a long way towards explaining why a builder change was required and what has resulted. 3/09/16 - There is good news....and bad! The N5 cabin car models have arrived in the states finally, unfortunately they arrived in the wrong city! Instead of coming directly to DTW in Detroit, I was notified that the models had actually arrived in Chicago, nice city, but! After extended finger pointing the situation was corrected and I expect the models to be in Detroit today. It's been a long haul with this project and I have faced virtually every setback possible, but I'm almost ready to start shipping to my incredibly patient clients. 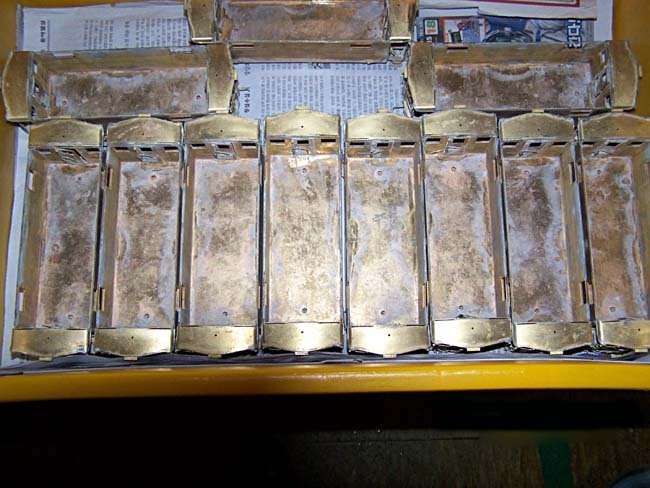 Stay tuned for the next, hopefully very positive update regarding the continuing joys of importing brass model trains. 2/21/16 - I am happy to report that the production models are finally on their way into the states, as always, dealing with airfreight issues has not been fun. The security checks of shippers has only become more stringent and in fact have eliminated several avenues for delivery. Our new arrangements will hopefully be a long term relationship so delays should be kept to a minimum in the future. Further updates will be provided as the shipment proceeds. 1/23/16 - During the project final inspection some quick 'shots' of various model versions were taken and several of them are shown below. Do not be concerned about the alignment of some components that look askew, this is due to the camera angle and the characteristics of the lens at close range. The photos are simply meant to provide basic impressions of versions not previously shown from the final production. 1/20/16 - I have received a number of inquires regarding the availability of models from this project now that it has been completed. Although all of our original orders have been maintained, there are some choice selections still available for purchase, some of the most interesting variations among them. If you are interested in purchasing one of our new N5/N5b models, take a look at the Project Information page to select the versions that are of interest, then get in touch with me directly and I'll be happy to let you know if your selection is available. Alternately, give me a call and I'll be glad to go down the list of available models. 1/17/16 - Just a brief update for the moment following my return from the final inspection of this project. In short, the finished project is one that all of us that have persevered through the process can be extremely proud of. I haven't written much about my new builder, but that is coming shortly. I have to acknowledge the fact at this point that he undertook an extremely complicated and difficult project which another builder had managed to totally screw up and not only did a creditable job of redoing it, he hit it out of the park as they say in baseball. The models are fantastic and I'll highlight the many high points of the production in a forthcoming update. Arrangements for shipping the models stateside are now underway and I'll provide a time-line for the arrival and delivery to owners in the next few days. You will see several photos taken during the inspection shown on the project site pages and there will be more shared as I catch up from the trip. 1/07/16 - Good news for all interested in this project, the final inspection of the full production will be completed next week! Once the inspection is complete, the models will be on their way stateside to my shop where the re-inspection, packing and shipping to reservation holders will begin. Every effort will be made to get the final shipping process rolling as quickly as possible. I look forward to sharing the final results of this project with all concerned. Photos of the final inspection will be shared on this page beginning next week. 12/10/15 - Just a brief update to advise that the N5/N5b production has been completed. The only situation remaining to be dealt with is the final inspection which has been complicated by my recent unexpected hospital stay/surgery that I mentioned a few days ago. I am currently seeking clearance to fly from my surgeon and checking flight and air-freight schedules to see just how fast I can get this final phase accomplished. I will update again as soon as I have information regarding this process. This project has seen every conceivable delay, but thankfully we're almost at the end! 11/04/15 - The new production of our N5/N5b cabin cars is in the final few days before I will inspect the production, a very exciting time for everyone that has been waiting for these models! I have had a number of requests regarding the availability of models for new orders and I am in the process of verifying what I will have available. I will be advising anyone that has inquired regarding the availability as soon as possible. 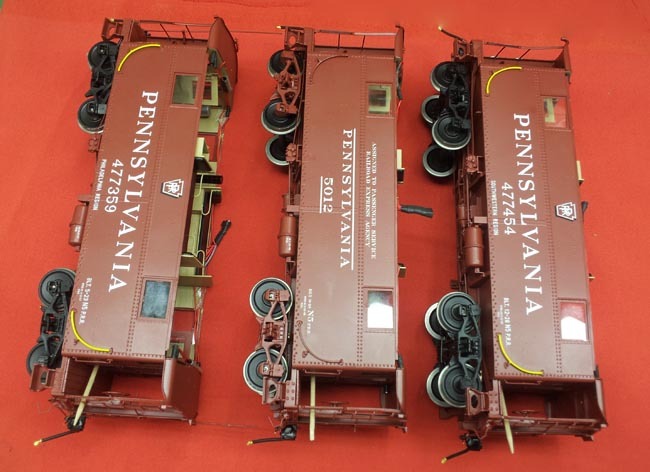 I recently attended the TCA York Meet and had the experience of meeting with one of Jim William's (Whitehall Hobbies) customers who had purchased a reject cabin car model. He came to the meet for the expressed purpose of seeing the new N5 sample on display in my booth. Long story made short, this individual was very upset after his review of the new sample as he felt he had been taken advantage of through lies and deception. My advice to this individual and anyone else in the same situation is to request a refund based on the apparent misrepresentations made during the sale. Anyone that has purchased a reject model and would like to get in touch with other 'customers' of Mr. Williams or the other individuals selling the rejects, if you will let me know, I will coordinate your efforts to make contact. 10/04/15 - The photos that were posted on 9/27 showing our new production N5 sample compared to a sample of the 'reject' models being sold by Bill Davis (American Scale Models), Jim Williams (Whitehall Hobbies) and Kent Loudon ('OLDGUYFROMNJ') stimulated a huge response with a number of lines of thought on the subject. The two most common comments were related to the representations that potential buyers have heard from the sellers and also if all the models were as bad as the sample photo indicated. As far as what the sellers have said in their sales pitches, it seems that many of you have already made decisions on that based on your feedback, with the typical used car salesman comparison being referenced as an insult to the car salesman. As far as consistency of quality in the reject production, you would have to judge that for yourselves since the three similar new photos below are either as bad as or worse than the original model photo posted. In the photo immediately below you can see that the paint build up on the rivets was so bad that when the paint dried it 'cratered' in the center of a number of the rivets pictured. There are a number of other cosmetic and construction faults visible aside from the mistakes previously documented on the Reject Information page, but you can pick them out yourselves, it's sort of my version of "Where's Waldo". So in response to all of you that have called or written, setting aside the personal animus from the lies told about this situation and the potential damage to the hobby this type of activity can cause, the obvious best suggestion is to be very skeptical when considering a purchase from anyone that pursues this type of business. The pursuit of personal integrity and commitment to one's customers often times does not come cheaply or quickly which leaves room for those who do not understand or care to attempt to realize a quick profit at the expense of others. I feel it to be an imperative to explain this situation in as much detail as possible for the benefit of my incredibly loyal customers who have waited so patiently for this project to come to completion. These photos speak more loudly than anything that I can write about why I walked away from the original production and also about the integrity of those individuals selling the rejects. 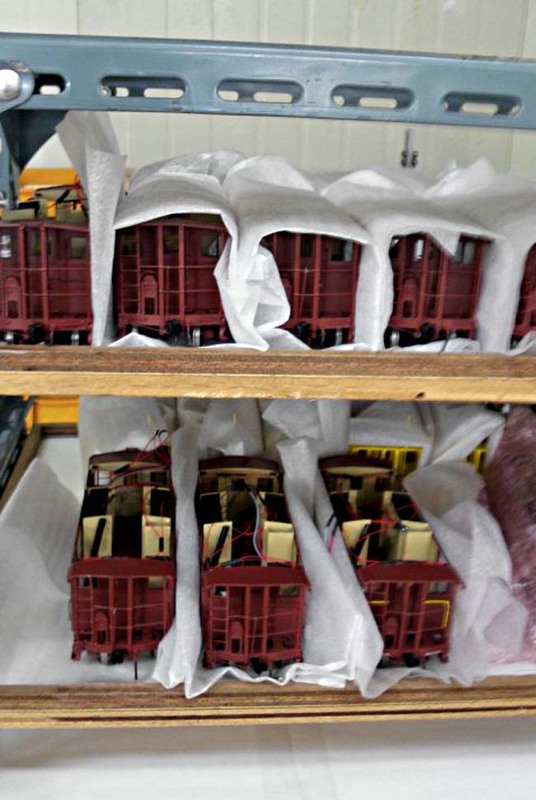 9/27/15 - Many modelers that have followed our N5 cabin car project are aware of the controversies that have surrounded it since the original production effort was rejected due to quality and accuracy issues and many have heard the lies that have been spread by those selling the rejected models in support of a unscrupulous builder and an effort to make a quick buck on the back of unsuspecting modelers. Disregard all of the errors and flat out mistakes that were listed on an adjacent project web page and simply compare the two images immediately below. The first image is of one of the rejected N5b models and the second image below is of one of our production samples for the new production. No further comment is required (the difference in lettering style is due to version variation), judge for yourselves the representations you may have read or heard from the individuals selling the rejects. 9/19/15 - The new production sample has arrived and it will be time to head back overseas to do the production inspection very soon. I have already posted a couple of new photos of the sample and will be doing a complete series of photos in the next couple of days, so be sure to check back soon. 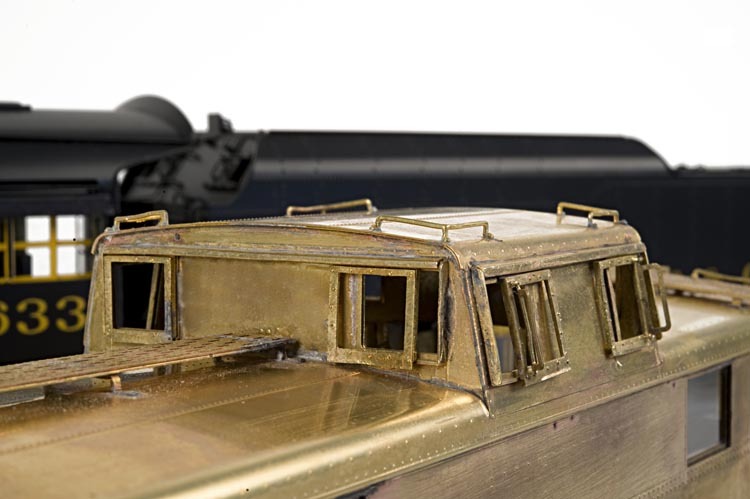 In short, I can tell you that I am absolutely thrilled with the quality of this model, the fit and finish are second to none and when compared to our N5c models, this is a stand out which is really saying something based on the popularity of our N5c project. 9/03/15 - Just a brief update regarding the cabin car project, I have a lot of information and images to post, but the most important information is the current status. Having just returned from another inspection visit, I can report that the N5 cabin car production will be completed this month! As we work through this month, I'll be working to bring everyone's paperwork up to date in preparation for the delivery of the models. I can also tell you that these models are built to a new standard, as new owners of our PRR FD-2/FW-1 flat cars have already found. I am obviously very excited to see this project finally coming to an end, but more importantly, I am looking forward to our customers that have waited patiently for so long having the opportunity to see what has been accomplished during the long wait. These models are truly exceptional! Stay tuned for more details very soon. 8/17/15 - Updates on this project have been infrequent as the project has neared completion. In an effort to illustrate just how much work was put into correcting what the previous failed builder had done, below you will see a 3D image capture of just one of the versions we are producing, this same effort went into each of the basic types that make up the total production. I have not posted any of the production photos up to this point, but I will do that prior to sharing the first photos of the completed production models. This project has seemingly gone on for ever, but it is nearly complete! The next three images are of a preproduction sample used to make the final modifications and adjustments prior to soldering all of the components for the main production. The images are prior to the final adjustments. This is an early Express version model. The next four images are of the preproduction N5 w/cp and antennas. These photos will give you an idea of just how much detail has been included in this revamped project. 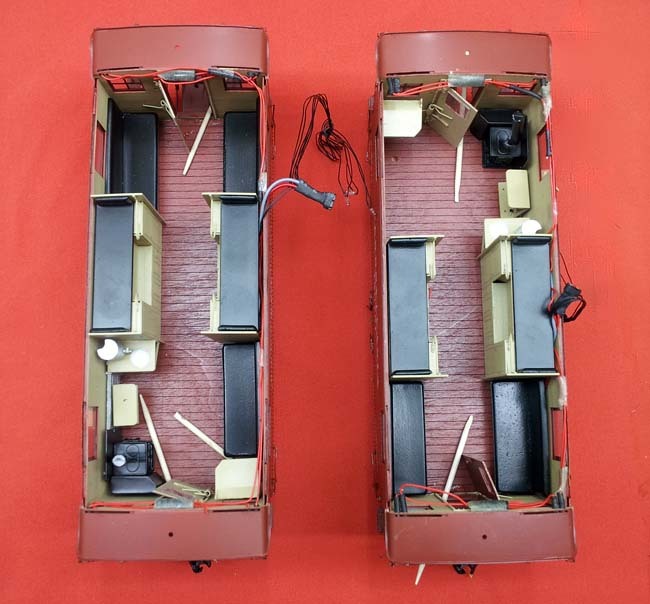 This same sample process was used for each basic cabin car type that makes up the more than twenty versions we have offered. 7/19/15 - Our new builder handling this project continues to impress as we work through the final production. What seemed to be obvious improvements to the builder, have been incorporated into the final production. There will no longer be an electrical tether between the removable roof and the carbody and the appearance of the trucks have also been upgraded. These changes and a couple of construction improvements were facilitated by moving the final development to our new 3D software system which makes visualizing the completed model much easier and predictable. The quality and consistency of construction and finish is already at a new level as illustrated by our PRR FD-2/FW-1 flat car project which was handled by the same builder. Expectations for this project are at a new high and the results will be so disappointing for those that said the project would never be completed! 5/22/15 - The Reject Model Information page has been updated with new information. 5/05/15 - I just had to pass along an interesting observation from one of my extremely loyal and knowledgeable owners regarding the ongoing effort to sell the junk N5 cabin cars that I rejected. The guy again trying to sell them on ebay does have some scruples, he writes: I consider it unethical (and just low down sneaky!) to use shipping and handling as a profit base! (his underlining and bold text). Apparently he doesn't have a problem with lying and misrepresenting the actual item he is trying to sell and feels making money that way is really good! If you figure it's worth the effort, visit oldguyfromnj on ebay and let him know what you think. 5/02/15 - Just a brief update to advise that a new written update is being prepared for our cabin car project to bring all of our reservation holders up to date on where we stand with the project. We are getting close to the finish and although there have been continuous updates online, it's time for a formal update. At the same time, I'll lay out some of the facts related to how the project has evolved to this point and give due credit to the 'players' that have done their best to profit from an unfortunate situation and at the same time supported a crook. I have to again acknowledge the fantastic loyalty of my customers who have stuck with me through this situation, I feel strongly that you will be glad you did when you see the end result. I will post when the mailing actually goes out so reservation holders will know when to look for the update. Our USPS continues to under perform, but I will do my best to make sure all involved see the update. 4/11/15 - Once the new production samples for this project are reviewed, I'll be posting an update regarding the errors that were corrected from the original reject models and the upgrades that have been accomplished. Apparently the reject model sales have not gone too well, the premiere 'reject' dealer is now selling the models at discount prices. Not only classless to support a corrupt builder, he now short-changes his own customers by undercutting the value of the models he previously sold. Just what the hobby needs more of, so be sure to watch for his latest offerings! 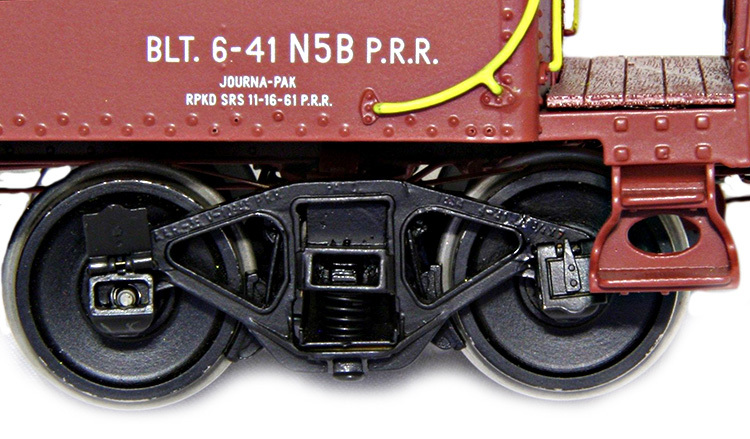 3/25/15 - The inspection date for our PRR flat cars has now been set, the inspection visit for that project will serve as an opportunity to see and review the new N5/N5b production samples. With the amount of review work and modifications that have taken place leading up to these new samples, my expectations are extremely high and I am very excited to see what all of our new efforts have resulted in. Many new photos will follow. 1/26/15 - I'm happy to report that the production samples are nearly complete and once they are approved, the production will continue. Our PRR FD-2/FW-1 flat cars are now nearly complete and the components for the N5 models have been staged so the final assembly will be ready to roll once the last flat car clears the assembly area. Photos of the new samples will be coming shortly. The quality of the work this time around is beyond my greatest expectations. 12/10/14 - The production of the N5's is right on the heals so to speak of the FD-2/FW-1 flat cars at this point. The final corrections and modifications were concluded and the production samples are going together now and will be featured in new photos very soon. As I previously explained, this project has slipped behind the flat cars in terms of delivery in an effort to keep our new production arrangement moving and to allow enough time to make sure the final product will be as it should. I have to admit to being a bit embarrassed by the fact that the quality of the original production got so far off track, but for anyone that has had experience in this business, it's not difficult to understand. The quality of the work being done now has brought real excitement back into this project for me and I feel certain that the same will be true for anyone that experiences the finished models when they are available. What is still very difficult for me and many others to understand is the total lack of integrity exhibited by the individuals that have been dealing in the rejected/junk original production models. Representing them as state-of-the-art and fine examples of the best model building by a one of 'Korea's foremost builders', what a joke. As the seller on ebay says, please carefully examine the photos and read all of the following before bidding, my take is that if you buy after looking at the photos presented, you deserve what you get. 11/10/14 - A couple of customers have mentioned that the rejected N5 models have shown up on ebay. It's interesting to see the photos which only confirm that I made the correct decision in rejecting the models before I paid for them without being allowed to inspect them. Forget the missing or incorrect details, both large and small and the paint colors, the photos speak for themselves; dirt in the paint, heavy paint build up on detailing, literally everything bent, raw wire used to secure details, the roofs do not fit correctly.........the list of problems goes on and on. All of that considered, the seller proclaims his expertise and assures buyers of the wonderful quality. He either is not very smart or he went to the same school of business ethics the other sellers of these models went to. Judge for yourself, I am rather biased obviously. 11/08/14 - I have been asked a number of times what the issues are with the rejected N5 models that are floating around for sale, as I have indicated previously, I will post a detailed listing of the problems in due course. In fairness to those potential buyers that are being set up by the bottom feeder sellers in the hobby, I will briefly mention the general issues to be considered before purchasing one of these models. Aside from the general overall inferior quality of construction and paint work, the paint colors are incorrect, the rivet patterns are not correct, seam detail on the body is not correct, there are missing brake components, the marker lamps are not correct, the electronics are not correct, the interior configuration is not correct, there is missing truck detail........other than that, I would have been happy to take delivery of the production. Buyers beware and seriously consider the integrity of those offering the models for sale. More will be offered in the next few weeks and the entire situation will be detailed from start to finish as the correct models are being delivered to customers that know and understand quality and that have been incredibly patient throughout this long process.. With the information that has been offered up to this point, no one should be surprised if they invest in a model that is not worth nearly what they paid for it. 11/04/14 - Just a brief update regarding the status of this project. I am currently waiting on the completed production samples for a final review before the production is wrapped up. Finishing this project and the flat cars is a bit of a logistical nightmare since we are all extremely anxious to complete both projects. At this point, the flat cars are moving at a quicker pace then the cabin cars. 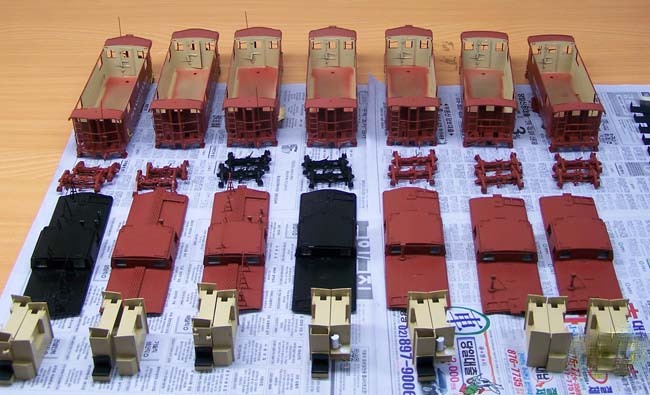 Although the flat cars have a very high parts count per model, there are many duplicate parts making up each model so the development and parts production time is considerably less than for the cabin cars. 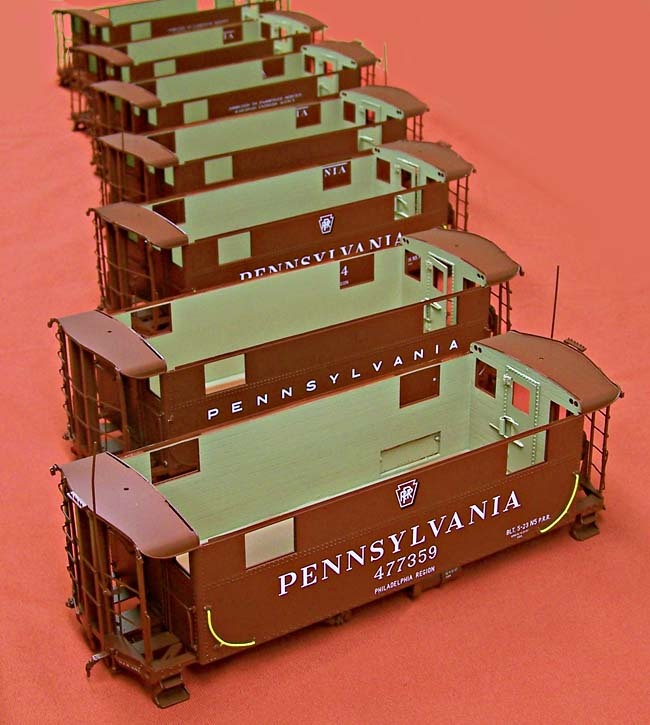 There are fewer parts in a cabin car, but with twenty-one versions, there are more unique parts to design, produce and assemble. At this point, to keep things financially viable, the two projects are running their course simultaneously. I hope to have more info shortly. 9/09/14 - It's been a long time coming, but we are almost at the point of delivering our N5 project. The great patience of our reservation holders will be rewarded with our best rolling stock project yet. As I explained going into the process of this new build, it has been more than an effort to simply complete this and one other project, the PRR FD-2/FW-1 flat cars, it has also been an effort to establish a long-term reliable build situation for a number of future projects. The second attempt at this project has been approached very cautiously for seemingly obvious reasons and I have not shared a great deal of detail about the new build for that reason. Following my most recent visit to work with the builder, I am very confident that the goals for the project have been met and that a solid foundation has been created for our next projects. With that in mind, I will begin to share the work that has been done in recent weeks and months leading up to the delivery which will begin next month. As work commenced on the second build, we had to evaluate what had been previously designed and decide whether the original design material would be used or if we should start fresh. We ultimately started with new design drawings and then set parameters for improvements that we would incorporate in the new models. At this point I will say that there were mistakes made in every area of the original construction, the carbody, underbody, roof and interiors. Details from various versions were mistakenly mixed despite the guidance provided to avoid those problems. All of those issues have been resolved and advancements have been made with the trucks, wheelsets, lighting, additional detail and greatly improved couplers. I will make an effort to have the update page brought up to date before the deliveries begin, but it will depend on the available time. The first four photos immediately below show the initial new build of an N5 version model. This sample was used to proof the main corrections and to provide a working platform for addressing possible improvements. The next four photos show the initial build of an N5 w/collision posts. There are substantial construction differences between a basic N5 and an N5 w/collision posts, so it was important to address those differences with a dedicated sample model. The detailing is obviously much different between the two basic versions. 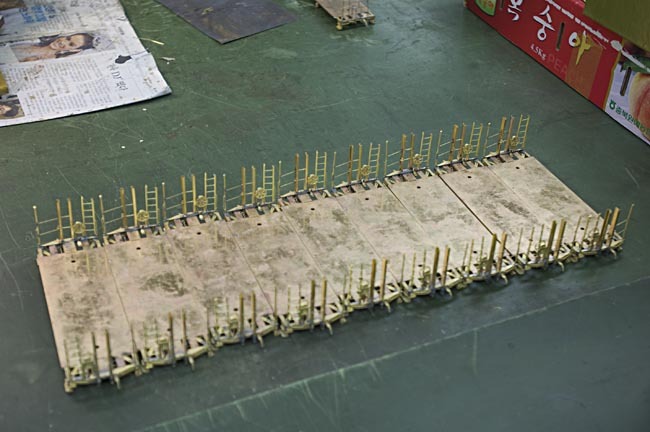 The final four photos show the initial build of an N5b version model. The differences between an N5b and an N5 w/collision posts are more subtle, but are very important to differentiate the two versions, thus the reason for a separate development sample. Many modelers in fact, have a very difficult time seeing the difference between these two versions which makes modeling the details correctly that much more important to avoid added confusion. 8/07/14 - The last of the latest round of project updates is in the mail, I have double checked to make sure that everyone that should be included has been. Fingers crossed, I am hoping this iteration goes without issues. I am very excited about the upcoming inspection of the first new models! As mentioned in the latest update, another will follow as soon as I have been to Korea and back. Also watch for new information posted here. 7/14/14 - An updated update is now being processed with the latest information on the N5/N5b project, hopefully the delivery effort will go smoother this time around! In the mean time, long story short, I expect to see the first of the new cabin cars at the end of this month. More details are included in the written postal update. 6/24/14 - I have heard from several customers that they have not received their project updates in the mail, as a result, I am mailing new copies to everyone to make certain that all reservation holders have the latest information. There is no way to explain the postal service situation! 5/20/14 - With a last minute visit to Korea arranged following the last update, I decided to hold that postal mail update until the most recent visit to Korea was completed, so I would have the latest first-hand information. The promised postal update will now be sent out in the next few days. 4/28/14 - The postal mail update for reservation holders for this project has been processed and is going in the mail. I am very happy to report that very solid progress is being made on the redo of this project. 3/13/14 - A postal mail update will be going out to reservation holders this coming week in order to provide the latest information on the redevelopment of this project. 2/01/14 - As we push toward the completion of our second effort on this project, we continue to make improvements every step of the way. The latest upgrade is to the wiring and lighting system. 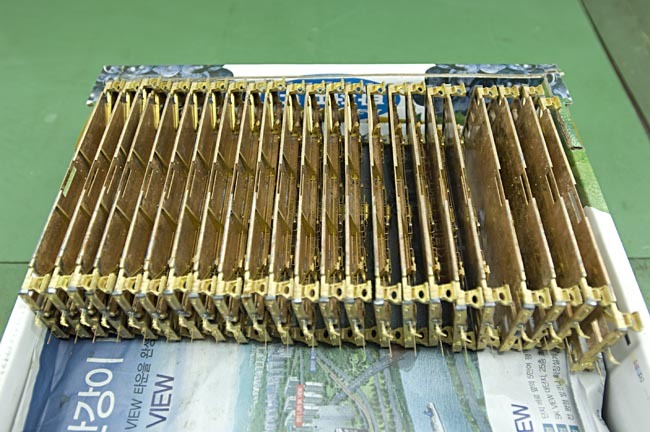 Extra effort is being put into concealing the wiring necessary for the interior and exterior lights, special low resistance small gauge wire is being used despite the relatively extreme cost. In addition, the lighting is being 'sectioned' as is the control. I don't want to give away too much at this point, I'll just say that we are taking full advantage of the electronics technology developed over the last couple of years. With our work in full swing in the new year following the holiday 'distractions', I'll be providing a projection for the completion of the project very soon. 12/11/13 - As was expected, some of the rejected models completed by this projects original builder are finding their way into the country and it is no surprise who is responsible. When the situation developed, a number of people shared their predictions of who they felt would deal in such products and it's pretty amazing how accurate those predictions have been. I'm not sure if credit should be given to those who conjectured about the situation, or to the predictable nature and reputation of the individual responsible. I won't bother mentioning names, I'll let the responsible individual expose himself, although he seems to be trying to hide from his efforts. At the appropriate time, I will be posting a list of the problems the original production models share as I have now had a chance to review two of the recently imported models. I can tell you that the final corrections were never made which is obviously why a demand for payment by me was made before I was allowed to see the finished models. To protect the owners of the new production models, the new models with have unique markings identifying them as authentic Kohs & Company products, there will be no mistaking the rejects for the real thing. The rejects are bound to wind up on ebay so I will make sure that anyone that is interested will be able to determine the true pedigree of any suspect N5 models. The nature and character of the individual responsible for the sale of the rejected models speaks for itself, it also speaks directly to the character of anyone that would knowingly deal with him. That is why it is important that I provide the appropriate information going forward so that buyers can be discriminating in spending their hard earned money. An update regarding the new production is being prepared and will be posted very soon. A written update will also be going out to reservation holders near term to explain exactly where we are in the production process. My focus has been on our Challenger deliveries in recent weeks, but it is certainly extremely important to update our anxious future owners. 8/04/13 - With the UP Challenger project completed, a quick return to Korea was in order to work on our rolling stock projects including the N5 cabin cars. The N5's will be the focus of attention from now until completion. Great progress has already been made and the significant improvements made possible by the project redo have already been implemented. Photos and more detail regarding the production will be forthcoming following this most recent visit. 6/03/13 - Having just returned from Korea, I can tell my N5 customers that great progress is being made and although it is never fast enough, the results I have seen are very positive and I am exciting about what is going to be delivered when all is said and done. More details will be provided as I get caught up following the trip. 2/23/13 - Following my most recent visit to Korea to inspect and follow up on projects, I am happy to report that our N5 project is now in very good hands. Discussions and preparation as well as initial work on the project have been going on since the end of last year and what I had been told was seen first-hand during this visit. This has obviously been a very difficult proposition for all concerned, the new builder picking up on work that had been basically completed by the original builder and then having to lay out a plan to not only meet the original goals set, but also implement the improvements that are now being incorporated into the new production. Needless to say, the financial 'hit' taken as a result of the original builder certainly made things 'interesting' to say the least. With the cooperation of the new builder, we have had to look for ways to cut costs without compromising the project and any thought of Kohs & Company making a profit was set aside. The positive side of this effort is that it will make future projects more doable than they otherwise would have been. I have routinely discussed the escalating costs of materials and labor that have been a huge threat to particularly our future rolling stock projects, the new approaches being implemented will help to alleviate some of that pressure. I can't go into too much detail since I also do not want to make those challenges any easier for other builders. I have also previously mentioned that reservations that have not been secured by at least the minimum deposit at this point will not have model production dedicated to them going forward. As part of the effort to cut costs, speculating on producing models that may not have an immediate buyer in the end makes no sense. I am looking very carefully at not only the total production quantity, but also the versions being produced. There will certainly be models produced for every paid reservation and if there are any extras produced, they will target versions that will be the most likely to sell quickly. The bottom line is that there will not be any extra production of the more unique or specialized versions that I originally offered, if that is something of interest to potential buyers now, I would suggest getting an order in right away to make sure that there is production to meet that demand. As the N5 production moves forward, we are actually producing component parts for six different projects at the same time. 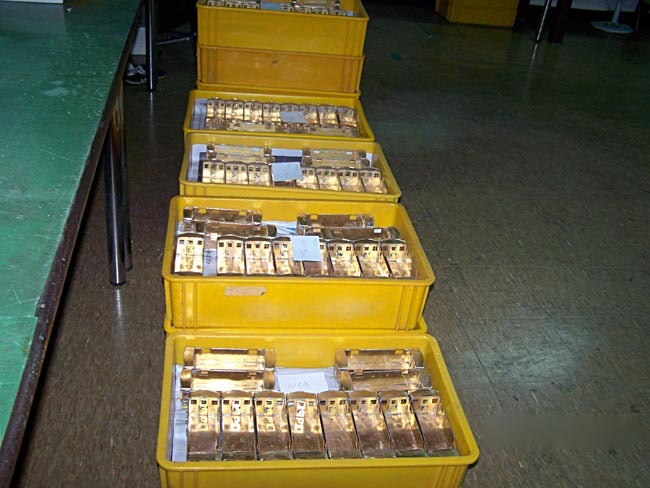 When there is a component that can be used on multiple projects, those parts are being stockpiled to save not only money, but time as well for our new projects. This approach requires extra effort and planning, but all involved feel that it will pay dividends in the future. One last important comment on the overall situation. Despite how unethical the actions of the original builder were, it is highly unusual for another Korean builder to take sides with an American importer which is exactly what has happened. For that reason, until the N5 project is put to bed so to speak, I will not be divulging too much specific information regarding the new builder. He will have his praises sung load and clear when the time is right and many of you will have the opportunity to meet him this summer at shows here in the states. I again thank all of the reservation holders for this project, your patience has been and is sincerely appreciated, it will be rewarded with a fantastic finished product as we head into the summer months. Stay tuned for more news very soon, it will be developing quickly! 1/28/13 - Take two of our N5 project is proceeding well and I am excited about the upgrades that we are incorporating this time around. There hasn't been and probably won't ever be a project where I wished that I had added some detail or done something in a different way; the positive side of the insane ending to our first effort on this project affords that rare opportunity. A reminder to all that the production quantities for this project are being realigned according to the demand and the only way to judge that is by the paid reservations. If you have a reservation where the minimum deposit hasn't been paid there may not be a model available in the end. A final side-note on the first effort; there have been many questions about what will happen to the completed models that were never delivered. It's difficult to know for sure, but the assumption has been that they would show up for sale at some point, imported by an opportunist looking to make easy money. I suspect that there may be a hitch in any such plan since the groundwork has been laid to have the models impounded should some other importer try to bring the models into the country. An unfortunate situation any way you look at it! 12/13/12 - A special note to anyone that had recently inquired about the availability of a specific version model for a reservation and had been advised that it was no longer available; with the change in production, I can accommodate new orders for any version in the near term, at least through the end of this month. If you have specific questions, do not hesitate to contact me for additional information. 12/11/12 - Despite my best efforts, the written project updates and account statements have just been mailed. Dealing with production questions and issues has been a priority since we are pushing very hard to make serious progress with all of the current projects. New updates will be posted to this project site very soon. 11/22/12 - A project update letter for all reservation holders will be going in the mail on Monday morning and updated account statements will be included. 11/09/12 - Just a brief update to advice that I just completed a week in Korea and have lots of news, including the status of the 'hostage' models. I'll be sending out a new written update to reservation holders once on the ground that will bring all issues up to date. 7/18/12 - I have been receiving a lot of positive feedback regarding the update letter that went out to reservation holders and I want to take this opportunity to again thank you all for your patience and understanding. 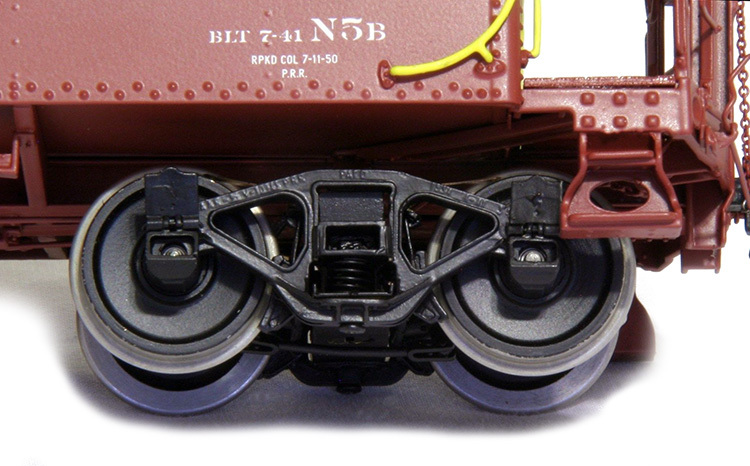 The first positive aspect going forward is that the N5's will now utilize our adjustable scale wheelsets. This is a major plus and will be only one of the upgrades incorporated due to our new production timing. Progress reports should be frequent at this point so check back frequently. 7/06/12 - As a follow up to the last posting, a written update will be going in the mail this evening, so reservation holders should be receiving it in the coming week. There has been a situation with the builder that I have been trying very hard to resolve and have kept quiet in an effort not to make the situation any more problematic than it had already become. Now that there is a clear path forward, the update will provide insight into what has been going on and where the project stands as of this date. Everyone's patience has been greatly appreciated! 5/25/12 - The printed update for our N5 project is nearly complete and will go out to all reservation holders very soon, the actual mailing date will be confirmed when it hits the mail. My apologies for the delay in providing an update, but there have been unforeseen factors to deal with and I have had to work through them without 'stirring the pot' as they say. My sincere thanks for the extreme patience that have been exhibited by all of my reservation holders. 2/13/12 - As of this date, the N5 production is nearly complete. Unfortunately, the mutually agreed upon production procedures were not followed. Be assured that no compromises will be made in achieving our end results!. A written update with more details will be going out to reservation holders shortly. 12/20/11 - Just a brief update regarding the first production models for this project. The first production models should be complete and on their way to my shop based on the schedule arranged during my last visit to Korea in late October. I am still awaiting word of the scheduled arrival of the first group and will post photos as soon as the models arrive. 11/12/11 - As many reservation holders now know, your most recent payment have been processed since the final stage of our N5 production is finally progressing. The photos below were taken of the production in Korea and I will also be posting many photos of the completed models as time allows for the effort of shooting and processing the photos for this project site. I know and understand that many modelers have been anxious to see the N5's in color so the photos below will provide a taste of what is coming very soon. The production will be proceeding as it was previously described in the last written update and I am trying very hard to coordinate the completion in a logical order of who paid first. 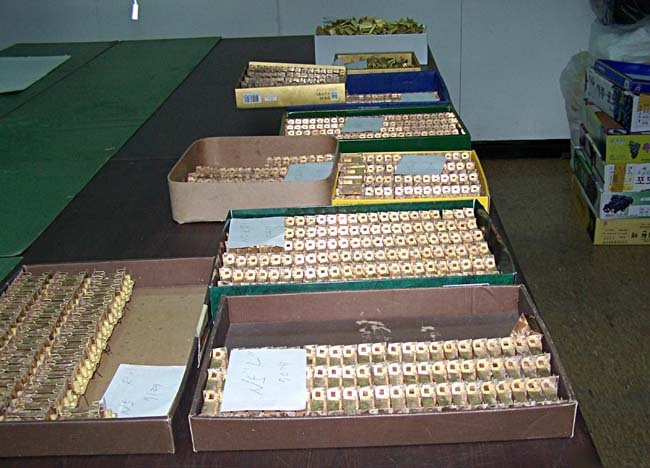 I'll describe in future updates the new difficulties of producing brass models, but there is more timely information to provide in the meantime. Shown above is a group of painted bodies being processed as a group as I described in my last written update. So far this approach seems to be resolving many of the issues previously experienced with all of our mass production efforts. Shown below is the same group of bodies now organized with all of the major components that belong with each individual model based on version. This provides an opportunity for multiple individuals to verify that the correct components are being used prior to being actually assembled. With twenty-five different versions now available, it really is a time consuming process trying to make sure that the correct components and details are used on each model. 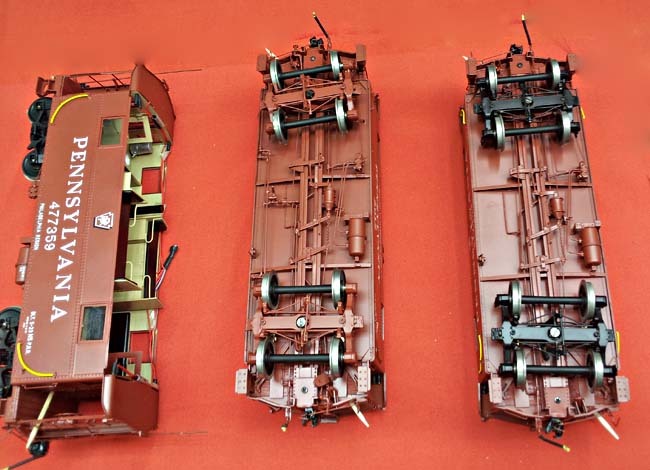 Shown in the photo below are three models nearing completion of the final assembly. You may notice that the model in the middle is one of the 'Express' version cabin cars that have created so much interest in this project. The model shown below is one of the early N5b variations with the early paint scheme. You can see that the level of detail included on the underbody is commensurate with what has become routinely expected of our models. Shown below is the complete interior detail included in our N5 project. Once again we are using real laser cut wood flooring and full interior and exterior lighting which is powered by a regulated circuit provided by Dallee Electronics which provides the most reliable electronics available. You may be wondering what the high-tech tooth picks are being used for; they are holding the exterior end doors slightly open during the drying process so there is no binding or stuck doors. 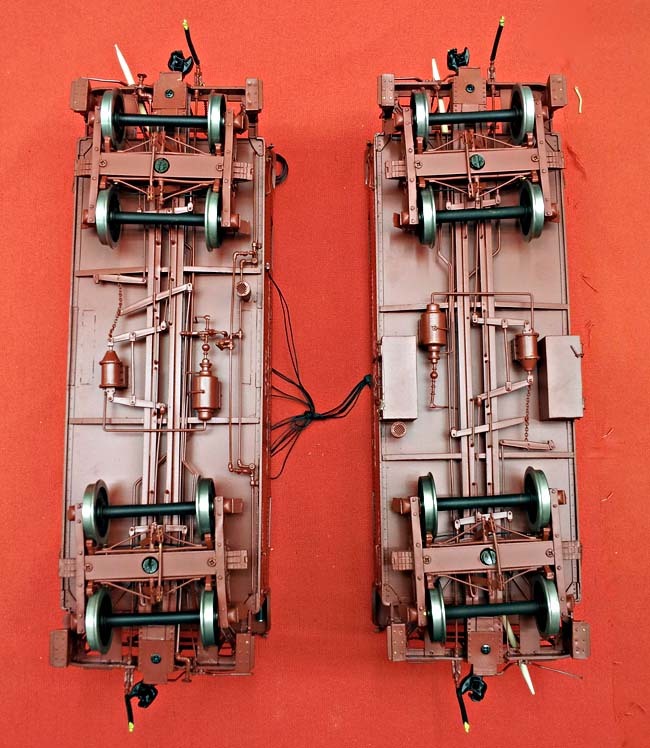 Below are two early versions of the N5 underbody, the one on the left is an 'Express' version which is determined by the inclusion of the plumbing for the steam heat radiators on the interior and the train steam line. 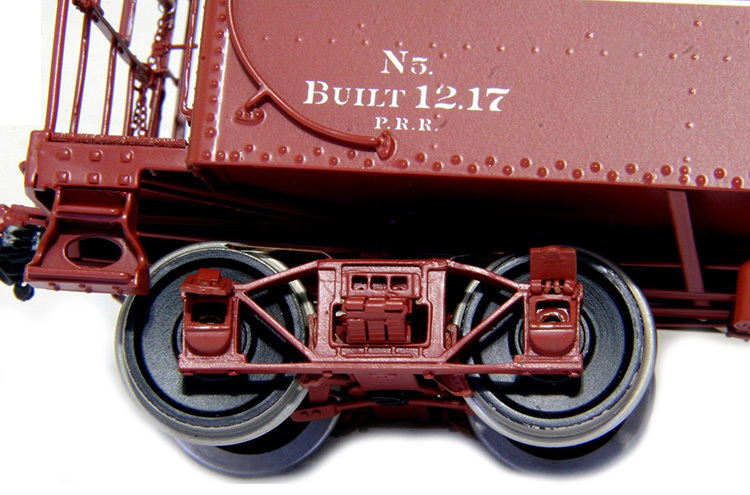 As usual, we are providing complete brake, structural and piping detail on these models. In the final photo, you can see two N5's w/collision posts, the model in the middle is a later 'Express' version, while the model on the right is a standard N5 w/cp. I have to mention that the fantastic graphics that we have for these models were again developed by Nick Seman who is the guru of PRR reference and design. Correct graphics can either make or break a project and I have always been able to rely on Nick for the best and most reliable information possible. This again is an example of the 'team' effort and the 'we' that I often refer to in talking about the models that Kohs & Company produces. 8/10/11 - I will be mailing out an update to all reservation holders soon and I will post exactly what day it goes out so there is no extra concern created about updates lost in the mail. Also, there has been a lot of concern about the fact that I have not processed the final payments that have been received to this point, that has been intentional, I have been waiting to get a bit closer to the actual delivery. If you are concerned, I will be happy to verify receipt, just let me know. I will assure you that the arrival dates of all payments have been duly noted to make certain that delivery happens in a fair manner. 629/11 - I have been made aware of the fact that several reservation holders never received their final notices, particularly overseas. The USPS has become less reliable than ever despite the fact that the rates have gone through the roof for the types of mailings we do. If you are a reservation holder that has not received your final notice for this project, please let me know immediately so I can get the information to you. I expect to be posting photos of the first painted production samples shortly. Quality photos are always a matter of either shipping the samples from Korea or doing the photography during the next visit so as not to interrupt the work in progress. 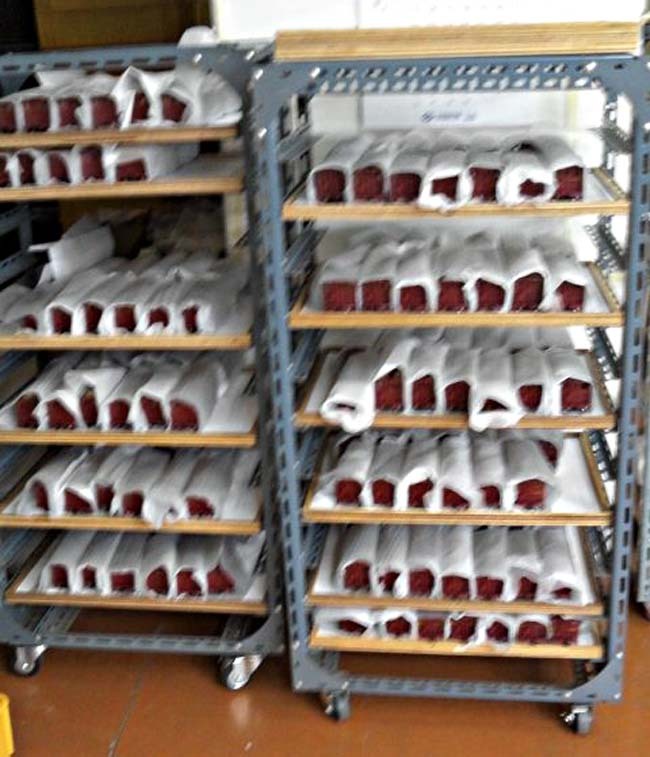 The first samples are used to establish the benchmark for the project, in other words, they represent the minimum standards by which the entire production is judged. Whichever way will expedite the photos will be done, because I know that everyone is anxious to see the results of our prolonged efforts. 4/20/11 - Reservation holders for this project should now be aware that final notices are going out, the way in which I receive the responses will determine the order in which the final finishing of the models will proceed. As described previously, we are going to try a new approach to the final processes that will have us finishing and shipping the full production order in smaller batches. This new process will hopefully not only expedite the completion, but will increase the quality of each model by allowing full attention to smaller numbers of models at a time. There have been a number of recent inquiries about model availability, there are models still available for reservation, but I again recommend that you contact me before ordering to verify particular version availability. When the first model arrives and is seen by customers, the remainder of the production will sell out very quickly despite the number of versions that we are producing. I have tried to avoid what happened with the N5c project by increasing the production quantity, but our sales are far ahead of where they were at this same point with the N5c project, so we'll have to see what happens. 2/14/11 - Just a confirmation that the write update for reservation holders is in the mail and will hopefully arrive very soon. There have been continuing reports that mail service around the country has gotten worse instead of better, which I can confirm based on the lost checks and 'lost in action' pieces of mail that I have experienced. If you do not see the update in a reasonable amount of time, let me know and a new copy will be sent. The project information page has also been updated to reflect the addition of the twenty-fourth model version which was in response to a special request. There is only one extra model being produced. The order/reservation form will soon be changed to reflect a change in status from accepting reservations with a deposit to accepting fully paid orders since we are getting very close to delivery. 1/25/11 - With my most recent inspection visit to Korea complete and the current status of our N5/N5b project assessed, a new printed update is going out to all reservation holders. In short, the project is near complete and will be wrapped up in short order, production samples will be available at upcoming shows and featured online in this project site. The patients of all that have ordered will be duly rewarded with our finest rolling stock project to date. Reservation holders should expect see their updates in the mail next week. Final payment notices will be going out near term to allow for processing and shipping organization prior to the arrival of the models. Further details will be provided in the postal mail update. One final closing note; more than one reservation holder has suggested that I raise the price on any models that remain available for purchase without reservation once the project is delivered. Although such a plan would potentially affect only a very small portion of any production to date, I have to say that I understand the rational behind their suggestion, but more consideration has to be given to all the ramifications involved in such a decision. If you are a reservation holder, let me know what you think. 1/14/11 - A new printed project update will be going out to reservation holders immediately following the upcoming trip to Korea. We are getting close to completion and I hope to have good news for the update. Stay tuned! 7/31/10 - I need to advise that a printed update is in process for all reservation holders for the N5/N5b project. The update is long overdue, but it will bring you up to speed on where we stand with the project. As with the Union Pacific Challenger project, I have fallen behind on sending confirmation letters to new clients as a result of travel commitments for production and research purposes. I will have my paperwork caught up by the end of this week. Along those same lines, if you are interested in reserving one or more of these models, please contact me directly first to confirm availability. 4/29/10 - As the paint work continues on our N5/N5b project, I have just received a request for a special version of this project. I am now working to include a Pennsylvania Reading Seashores Line version of the N5. 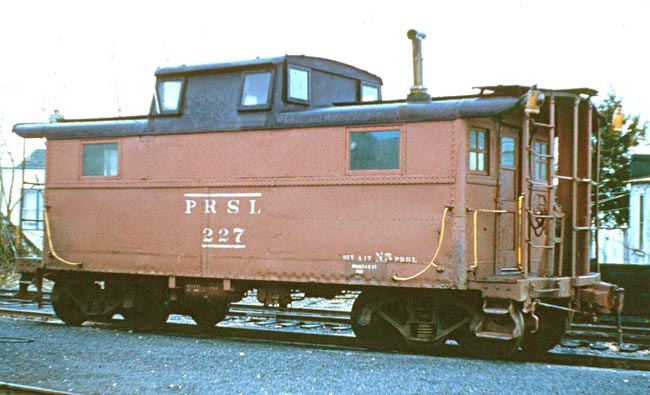 This version is the basic freight-car red exterior with black roof, the PRSL markings and car number are white in color. If anyone else is interested in this particular version of the N5 please let me know right away and I will try to adjust what we are producing to include enough models to meet the requests. The photo below was fprwarded by the individual requesting the special version and I believe the photo was provided by the PRSL Historical Society. 3/21/10 - There have been numerous inquiries about whether or not I am considering using our newly proposed wheel standards on our N5/N5b project, in short, no it is not possible. This project is too far along in production at this point to make a change of this magnitude. If we do adopt the new Kohs & Company standard on subsequent models, new wheelsets will be made available on a 'cost' basis and they can be changed over very easily by owners. I will continue to update on this issue as the project proceeds. 2/21/10 - All of the detail sorting issues have been resolved at this point and the concentration is on completing the paint work so that the project can proceed to the final assembly phase. I have to repeat again that this will be our finest piece of rolling stock to date and that is a real accomplishment. My observation is based on exactly that, comparing the work currently being done with that on previous projects. To the credit of those actually doing the production work, new 'tricks' and techniques seemingly are developed with every project which leads to finer and more consistent results. I believe that disappointment will be in short supply when we get to the delivery of these models. 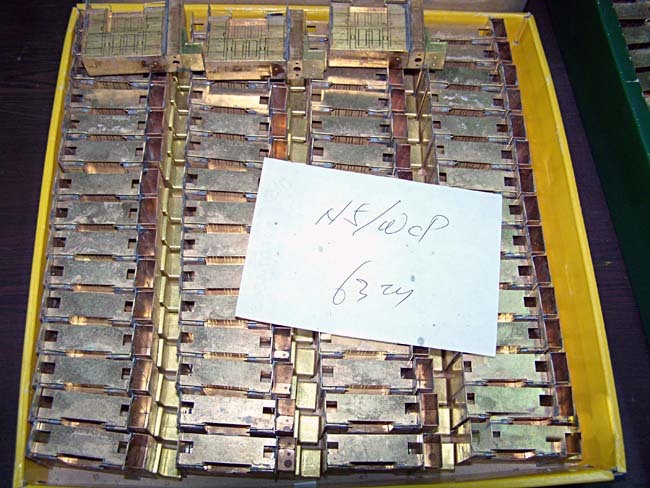 Considering what models from our N5c production are reselling for, our N5/N5b project is a real bargain! With so many versions spread over the production quantity each version will be represented by a very small group of models. 12/08/09 - Although the progress on our PRR cabin car project has been very good, the number of versions that we are producing has been a hand-full to coordinate. Making certain that all of the appropriate detail is included with each version has required more personal attention than usual and as a result we have fallen short of our goal of having this project completed before the holidays. In fairness, I have to bear the burden of this situation, but I hope to have everything wrapped up after the first of the new year. The results of our builder's efforts will certainly make the short additional wait well worth while. The exciting news for us is that this project is almost completely sold out! I have to thank those of you that have once again placed your faith in our modeling efforts by booking your reservations for this project. I am admittedly a bit behind sending out order confirmations for the most recent flood of orders, but I hope to have that paperwork caught up in the very near future, your patience is greatly appreciated!! I'll be posting new photos to this project site as soon as I can get them processed for the web, it's always a matter of time or lack of same, but I'll get it done as soon as possible. 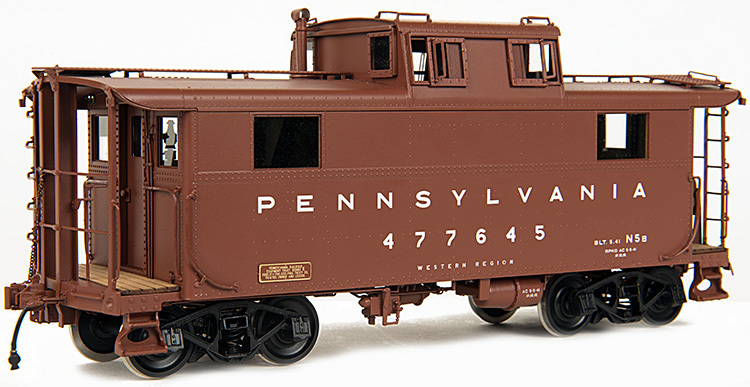 7/30/09 - While production is progressing smoothly, we have added two new versions to our project, an early PRR paint scheme and a Cumberland Valley Railroad paint scheme. There are only minor detail changes required, but the paint schemes offer some unique character with these versions. You can see the graphics arrangements for the two new versions by visiting the project information page and click on the two added version links, the first two on the list. 7/17/09 - The series of photos below shows that we are in the final stages of this project. 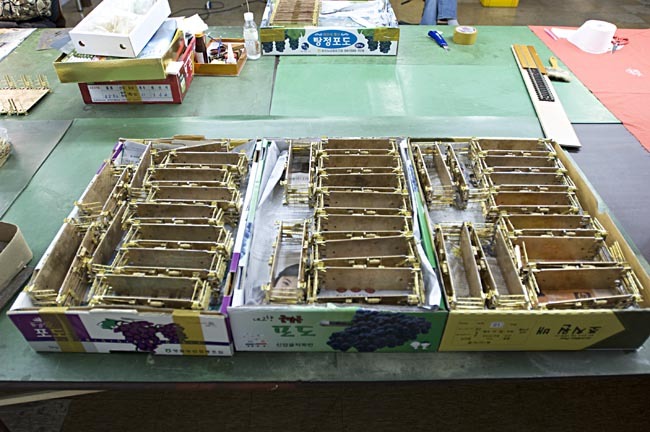 Thousands of individual parts have been produced and the very difficult part is to keep them all separated according to version types, particularly with the 21 versions of this project. Once the individual sub-assemblies have been been built and separated, they must pre prepared for painting, again according to version. Typically one individual in the shop is assigned the task of learning each version in detail and then being responsible for organizing the components as they move through the production process. With the volume of pieces involved, it is easy to understand how mistakes can happen and amazing that they are most often avoided. The production process had been held up by my absence, because I routinely inspect major assemblies at each step of the process, particularly before they are painted. Happily the routine has been reestablished and we are moving toward the completion of the project. 5/18/09 - We have updated our project information page for this project and it now includes links to graphics layout illustration pages showing each of the twenty-one versions we are producing. More development photos will be posted shortly. 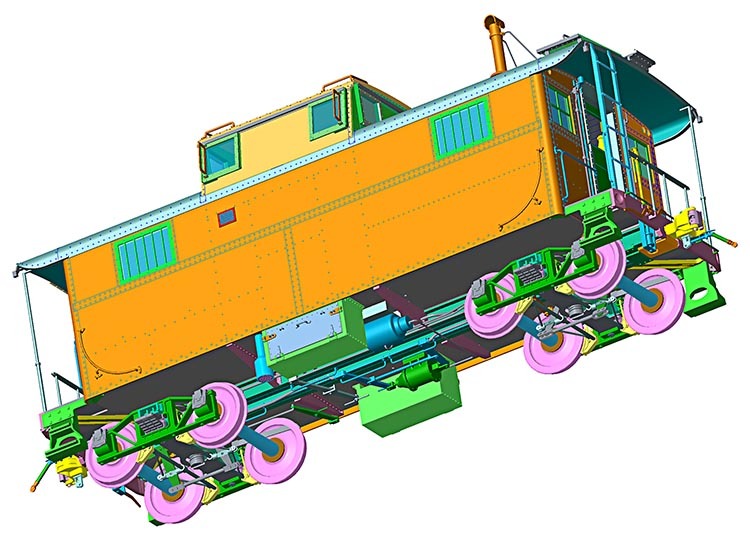 4/20/09 - Although it had not been our routine practice to issue printed updates regarding our rolling stock projects, that is what we are in the process of doing for our N5/N5b project as a result of our prolonged distraction from our regular online updates. All of our reservation holders for this project will receive a printed update by postal mail so that everyone, including those without Internet access, will know exactly where we stand with this project. We hope to have this new printed update in the mail within the next 7-10 days during which time we will also be updating this project web site. 10/04/08 - We have spoken very often over the years of the unique modeling opportunities that each project we undertake offers and we again highlight that situation. While the N5/N5b cabin cars are very similar in design and construction to the N5c class cars, there is one very distinct difference which at first glance seems less than important until you consider the modeling implications. Shown below is a sample of the N5b cupola with functional cupola window sashes. Offering opening sashes seems easy enough when you consider interior mounted sashes and not many builders/importers have even offered those, but when you consider exterior mounted sashes, it's a whole different story especially when trying to maintain the scale of detail. We have worked with our builder Mr. Sin to develop what you see and it not only offers functional features, it contributes to the very exacting scale appearance that we always seek. At the outset we were not certain that this feature could be achieved without distorting the overall character of the models, needless to say we are very happy with what has resulted from our mutual efforts. Often times critics consider it am obsession that every door or window must open or that every detail that should be function actually is, they miss the larger point, the resulting character of the model that is achieved through the effort and the enhanced level of detail functional or otherwise. In the end, will the N5/N5b project cars be better models than the N5c cars? The circumstances and characteristics of the prototype force us to raise the modeling bar to be consistent with our goals so yes, the N5/N5b models will be finer examples of the modeling art. We hope to add more develop and construction detail information in the very near future as time allows. Please check back often! 9/28/08 - We have just reviewed the latest work on this project in Korea and it is outstanding to put it mildly. As popular as our N5c project was, it does not measure up to what Mr. Sin our builder is doing with our N5/N5b project. 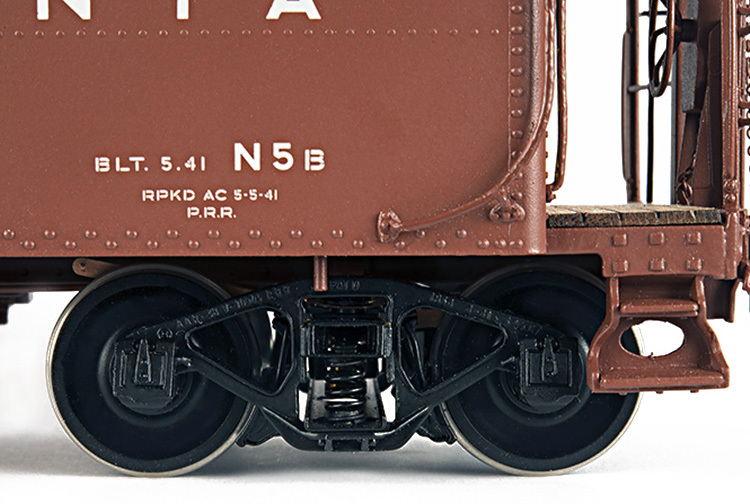 We'll be posting new photos shortly, but one of the most outstanding features is the operating cupola window sashes, the O scale hobby has not seen detail like this, the finest N5 scale model to date happens to be in 1/32 scale and it does not offer this feature. Stay tuned for more information. 7/14/08 - The project brochures and order forms are finally in the mail to all existing customers, if you are an existing customer you will be receiving the information shortly along with the Union Pacific Challenger information. If you are interested in this project and are not an existing customer, please make sure we are aware of your interest so we can get the project information to you while there are models available. Further details will be offered shortly. 12/14/07 - We have posted new photos of the project sample models on the project home page and information page and we are very close to starting the reservation process. The project is running ahead of where we are in terms of informing our customer base regarding the project because we have been so consumed with delivering new models that have recently been completed. We will be making every effort to catch up with the offering and if you are interested in the project be advised that the offering will be forthcoming. This again is a very complex project in terns of versions and variations and we are offering three different truck styles based on period information. Mr. Sin our builder of rolling stock has been doing a fabulous job with our projects and he has demonstrated what can be accomplished with a cohesive effort between builder and importer. We will be posting many detail photos as time allows, but we are still concentrating on model delivery, we'll take a break every once in a while to update things on the web so stay tuned. 8/17/07 - You have probably noticed that we have included in this project site the first photos of our first sample models for this project, please keep in mind that the photos do not represent complete and corrected models. 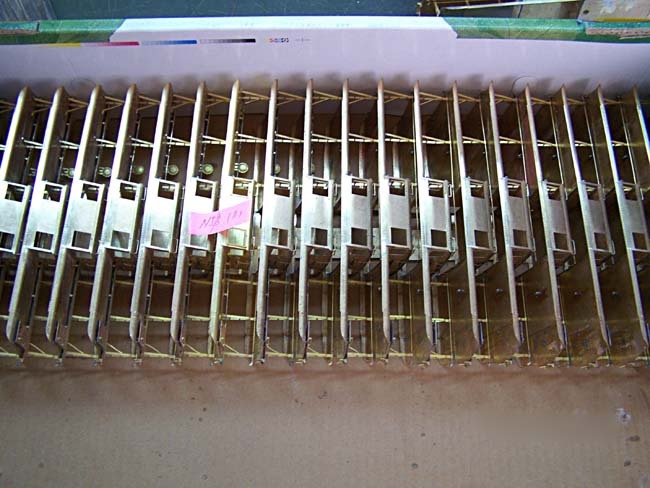 We will have the finished samples in hand very shortly and will be posting an extensive array of photos showing three of the basic versions: an as-built N5, an N5 w/collision posts and an N5b w/antennas. The formal offering for this project will be mailed in approximately two weeks and we again caution based on our previous experience with our N5c project. that the most desirable versions will sell very quickly and it is a first come first serve situation starting with our existing clients. The variations that will be produced are listed in a document currently available from the download page, it is titled N5/N5b Production Variations. As good as our N5c project was, we have again broken new ground with our N5/N5b project and you will begin to see that detail reflected in the forthcoming photos. We will also be posting a series of construction photos which seem to be very popular with customers and general modelers alike. Stay tuned for much more information to come! 7/12/07 - We have posted a listing of the proposed production variations for this project and it is available for download from the Project Downloadable Files page. You will see that it is an extensive offering, but with a total production quantity relatively low each variation is going to be a very limited offering, some variations will have as few as four (4) models produced. There were additional variation possibilities that we had to rule out at least initially, but if there is something that we missed and there appears to be a significant interest we still have time to adjust our plans. This promises to be one of the most interesting projects that we have undertaken. 6/28/07 - Plans for our upcoming N5/N5b project have been further 'fleshed' out and it has been a difficult task making the decisions required regarding the versions to produce. We will be posting the official offering in the coming days. but just to give you an idea of where we are headed, we will produce versions ranging in service period from approximately 1930 all the way up to the mid 60's. We will build standard N5's, N5's with collision posts and of course N5b's. There will be variations with and without antennas, there will be 'Express Rider' variations in a couple of different time periods, there will be a limited 'Futura' variation and as we did with the N5c, there will be a 'Buy War Bonds' version. The versions selected will include the use of three different trucks to make the models exactly 'period' correct. The first samples will be delivered to us in approximately three weeks and leading up to that time the initial reservation information will be going out to existing customers. After we completed the N5c project and the models were delivered there was an extreme amount of complaining about not being able to buy the specific variations that individuals wanted, we will remind everyone again that the process is a first-come-first-serve proposition, first among existing customers and then the balance of individuals that have expressed an interest in the project. The only way to be certain to get what you really desire is to place an advanced reservation with us. We have seen the most desired versions of our N5c project fetch as much as $750 in the secondary market and that situation is not likely to improve. 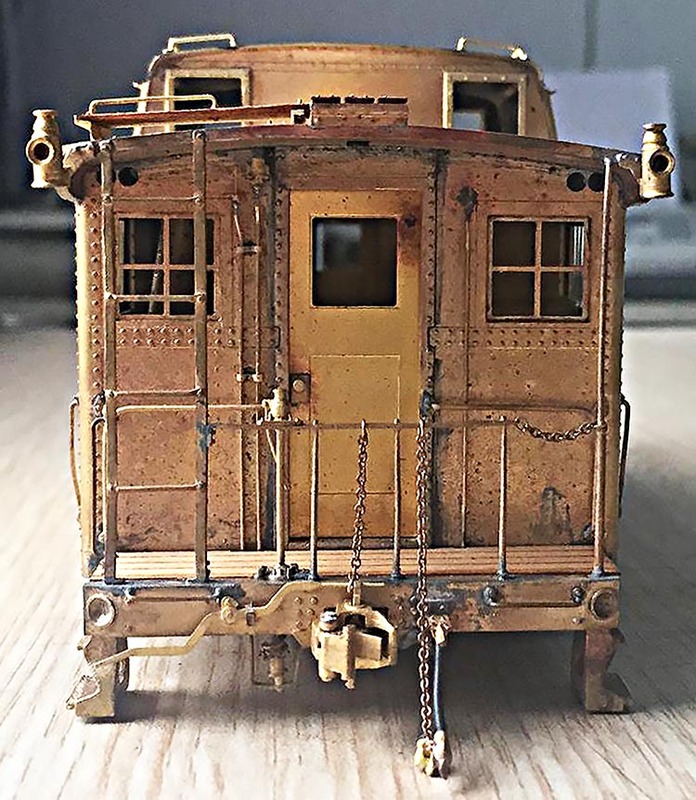 The quality of the work our new builder is doing with our rolling stock is the finest we have seen anywhere, the N&W cabooses and PRR G22b models that we will be delivery shortly will certainly set the stage for our N5/N5b project if the N5c did not already. 1/14/07 - We have posted drawings on this project site that represent the basic versions that we are producing. There will be variations in design and several variations based on period markings. The basic design is complete and sample parts are in the works as of this writing, so sample models are not far off. Some decisions regarding version have not been made as yet, for example, we are producing an N5b, but we have not yet decided if we will do an N5 with collision posts. You may be scratching your head or you may realize that there is a difference between these two cabin cars. We are also looking at producing an 'Express Service' version of the N5b, if there are specific versions that you would like to see done there is still time to let us know, but please do it very soon. 6/29/06 - Just a brief update to advise that the N5/N5b project is being expanded to encompass some special versions that were based on this cabin car class. Further details will be forthcoming in the very near future as we continue to develop and design this project. 12/25/05 - With new production capacity commitments in place, our N5/N5b project will be pushing forward in the coming months. We anticipate making the official offering and starting the reservation process early in the second quarter of 2006. More details will become available very quickly as we are actively planning the production at this time.